With my daughter growing up much more quickly that I imagined, I have started some investigation into what will be her “big girl bed”. What I have discovered is extremely disturbing! There are tons of toxins in mattresses and boxsprings that off-gas into the air – and we breathe it all in while we’re sleeping. Adria Vasil’s book Ecoholic Home has been a fantastic resource, and I would highly recommend it to anyone looking at updating anything for your home. So, what’s the lowdown? Fire retardants were implemented as a standard in mattresses because, I have heard, people were smoking in bed, falling asleep, and then setting their beds and themselves on fire. (Really? So the government decided everyone needed fire retardants on their beds? Including crib mattresses? Were babies smoking in the 50s too??) A family of flame retardants called PBDE (polybrominated fire retardant) has been shown to “stick to your fatty tissues and mess with thyroid and liver functions; even low levels have been shown to affect fertility” (Vasil, p. 85 of Ecoholic Home). YIKES!! These have been around since the late 80’s and are common in furniture foam, fabrics, and plastic casings. Ick. Supposedly most of these types of retardants are no longer used in mattresses, but I am definitely going to be looking at what is actually being used as a fire retardant in the mattress I get. Then there’s polyurethane. Basically anything with foam is made from this stuff. Polyurethane is petroleum-based, and the biggest problem is the off-gassing of VOCs (volatile organic compounds) – including the neurotoxin toluene. That is scary. We’re inhaling this stuff as we sleep. What about a boxspring? You’d think that would be pretty straightforward – some pieces of wood hammered together to be a support for your mattress. Well! “Less expensive frames made of plywood or particleboard are generally bound together with carcinogenic urea formaldehyde, which continues to off-gas while you sleep” (Vasil, p. 113 of Ecoholic Home). Oy! This is just the beginning of the nasty stuff I found out about what the heck we are inhaling when we’re sleeping. I’ll have to get to the bedding part next time. We need to get to solutions here! Warning – mattresses without all that other gross stuff are definitely more expensive. It’s just not fair. But IKEA does have 2 green options that are much more affordable if you’re not made of money or haven’t recently won the lottery. That’s where my daughter is getting her big girl bed mattress! 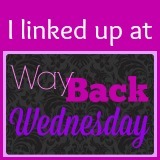 This post was linked up at Creating My Happiness’ Way Back Wednesday.